The urban landscape combines with a rural Dutch postcard in this look through the train window leaving Amsterdam. 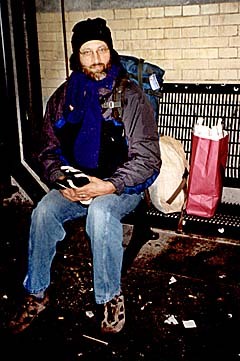 Obbie waits for our train out of Haarlem. Friday was a travel day to get from Haarlem back to Freiburg, Germany, where we'd stayed with our friends Bobber and Elena a couple of times before, and where Bobber was planning a traditional Thanksgiving dinner for Saturday. After the morning commute was over with, we got on a train to Amsterdam. Now that Ben & Jerry is owned by a Dutch food conglomerate, there's a B&J store on the platform of the Amsterdam train station. They had it in England as well, for double the American price. It must cost a lot to ship ice cream across the ocean, and it was a price we were not willing to pay. Even though our rail passes get us on the trains, they don't guarantee that we'll have a place to sit. For that you need a reservation. Being that we'd be travelling on Friday afternoon, we correctly anticipated a lot of traffic on the trains we needed to take to Freiburg, so we stopped at the ticket office in Amsterdam to buy reservations. Once we had our reservations in hand, we had about two hours to kill before our next train, so we stashed our packs in a train station locker and set out to find some coffee. Once we were properly caffeinated, we had a chance to photograph some of the sights that rain and darkness had prevented us from shooting the previous day. Then we retrieved our packs and got to the right platform with time to spare. To get from Amsterdam to Freiburg required a change of trains in Koln (Put two dots over the 'o' to spell it right. Most English-language maps call this city "Cologne."). The train from Amsterdam to Koln was sparsely populated, and it flew along at what seemed like upwards of 120 mph. 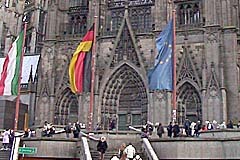 We scheduled a layover of an hour and a half in Koln because we'd heard of (and seen pictures of) the enormous old cathedral that's there, conveniently located right next to the Bahnhof. We popped out the front door and into the plaza outside the Bahnhof and took our pictures from there. This is one of those churches that took hundreds of years to build, and you have to be there to comprehend its enormous size. Koln is to Germany what Chicago is to the United States: it's a major rail hub. Its station is the busiest we'd seen in Germany, and after Hamburg that's saying a lot. There are plenty of good places to eat on the main concourse, and we had a fairly decent meal at a place called "Casserole." Yep, their specialty was casseroles. Our train to Freiburg was the main line train along the Rhine, which started north of Hamburg and ended in Basel, Switzerland, running each way every hour. By the time we'd gone for our reservation back in Amsterdam, non-smoking first-class seats were sold out, so we had to settle for non-smoking second-class seats (as far as we're concerned, any seat on a smoking car is fourth-class). Riding with the "huddled masses" wasn't so bad; the seats were only slightly smaller than first-class seats and we didn't have to hang out with suits for four hours. We got to do a lot of work on the week 6 web site while the Rhine valley passed by in the late afternoon darkness. Most trains have an operator's station at each end. 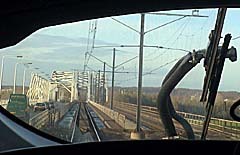 Our train from Amsterdam to Koln was designed in a way that offered a view through the rear windshield. 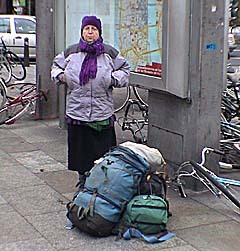 RoZ watches over our packs while Obbie takes pictures of the Koln cathedral. 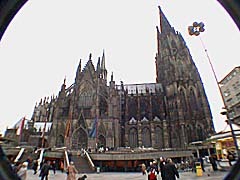 This massive cathedral in Koln took hundreds of years to build. Below is a tighter view of one of the entrances.